Bridgestone continues to pioneer new technologies for Rubber Tracks. The following features are now available. Our foams are environmentally friendly. We adapt the green procurement concept . Materials such as lead, cadmium, halogenated flame retardants are not used. Due to its low air feature, they can also be used as sound-reducing components. 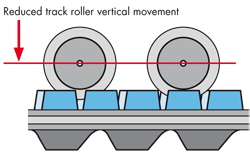 Bridgestone has reduced the vertical movement of the track rollers by adopting an advanced tapered protrusion technology. 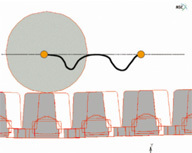 The tapered shape of the running surface of the protrusion optimizes the roller path against the natural rotation of the core metal under vertical load. This results in good ride comfort without the need of additional material. Avoiding the use of additional material is in line with Bridgestone’s environmental policy. 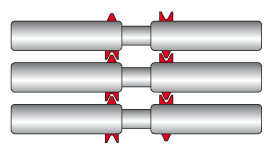 Bridgestone uses an interlocking design to reduce de-tracking. 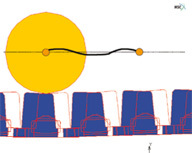 By interlocking adjacent core metals the track benefits from more lateral stiffness. 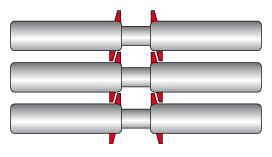 Both single and double interlocking systems are available.